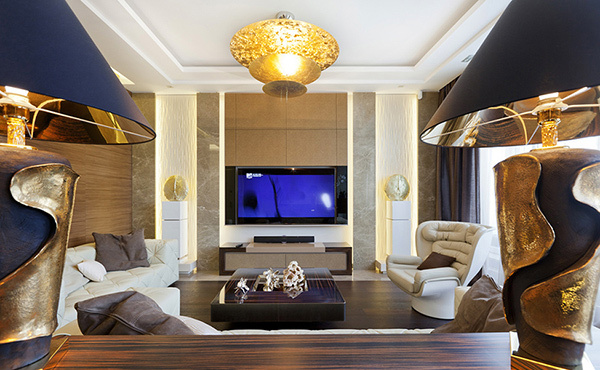 When you think of a luxurious interior, what comes to your mind are intricately designed furnishings, large crystal chandeliers and even metallic colors. 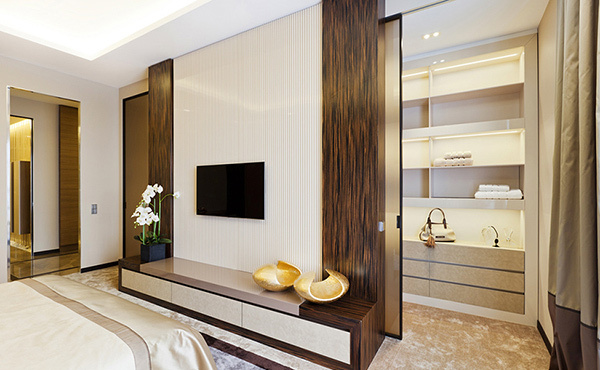 Yes, an interior would get that instant luxurious appeal with sheen and glossy elements in it. 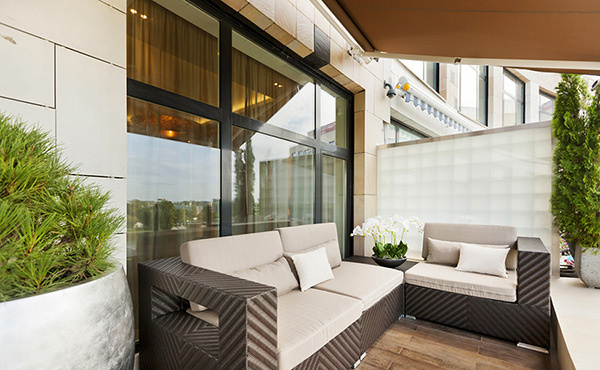 That is one of the features of this private apartment but it is actually more than that. Extravagant items were brought together to make up the interior of the apartment and to aptly qualify to the peculiar taste of the homeowner for a majestic and eclectic design. This apartment is located in St. Petersburg which is the Russian capital of art and culture. The kingly interior of the house uses restrained color palette of royal blue, gold and flawless white. 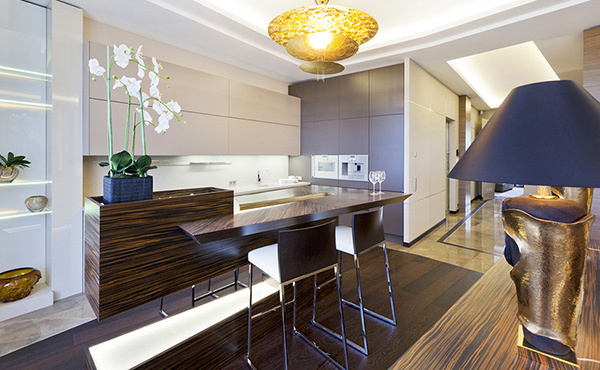 It is comprised of two sections, one for the living room, kitchen and dining area. The other section holds two bedrooms with wardrobes. 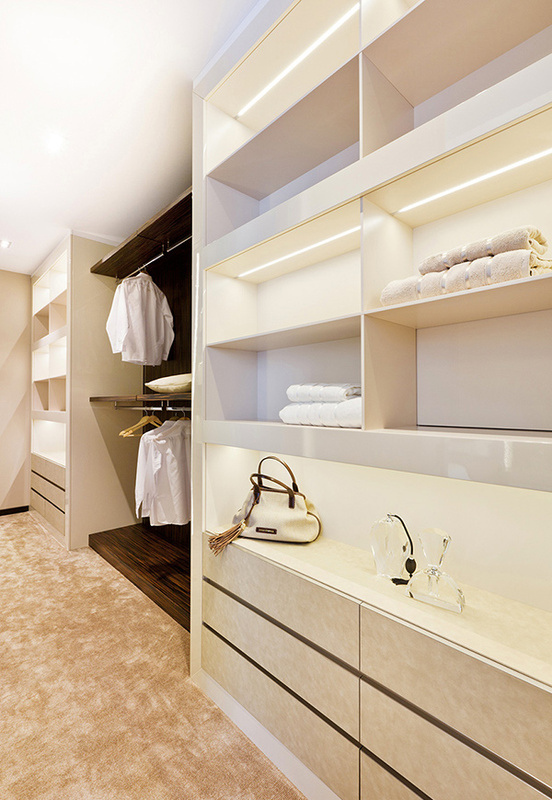 Luxury is seen all around the house as it combines premium class decors, natural materials and quality fabrics. But despite being sophisticated, the interior remains cozy and warm especially with the addition of comfortable and delicate furniture. Want to see how magical the interior looks like? Scroll down and prepare to devour its grandeur! Insanely dashing living interior! 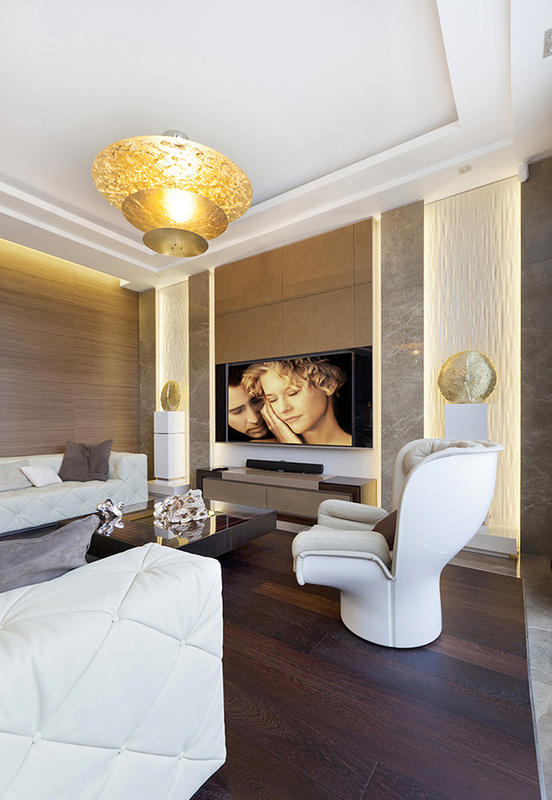 From the chandelier, table lamps furniture and all, this is one living room that shouts “sophistication”! The City of Angels seems to come out of the screen to sprinkle magical dust of beauty and glamour to this interior. That chandelier in gold in not just lovely but is a perfect centerpiece too! You can notice that in every inch of this apartment, you will see a spot of luxury from the drapes, decors and even for that sliding partition/door. 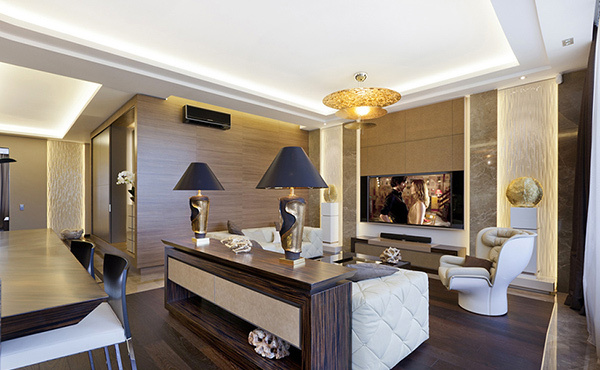 The twin table lamps are perfect Art Deco additions to this space. The wall decors as well as the furniture have that Art Deco style in it too. Restrained color palette is used for the interior as it successfully combined natural and extravagant elements. 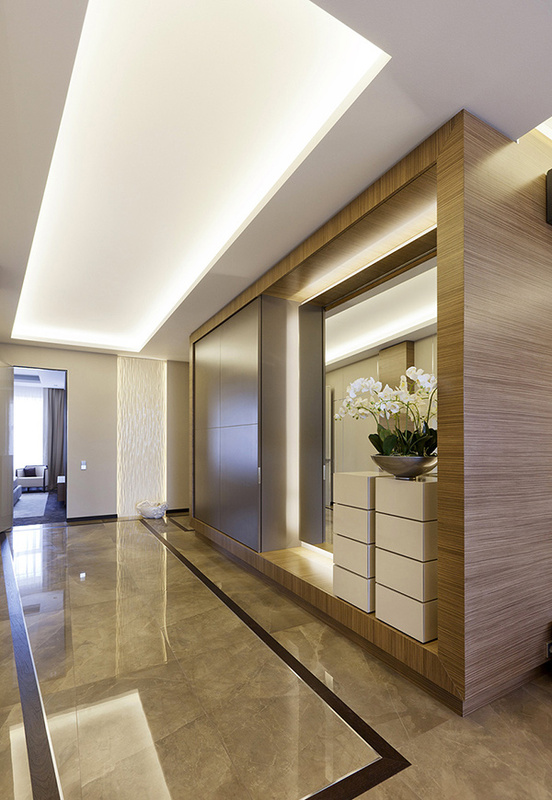 The refined flooring exudes sheen and charm as it gives a feeling of being an a five-star hotel lobby. 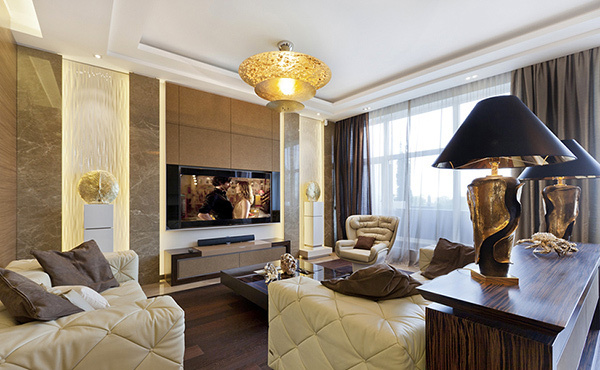 Even the television sits like a king as it is seemingly framed in gray marble strips and golden wall accent on the top. You can also notice how lovely the center table is! Just beside the living room is the dining area and kitchen that used wood for its counters. The beautiful flower placed near the island is very attractive. 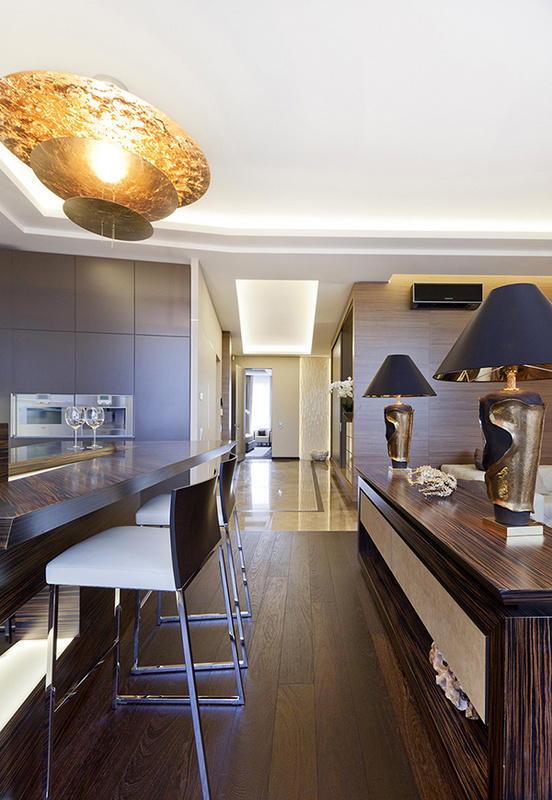 Wooden flooring tones down the luxurious aura of this space and brings in warmth and coziness into it. White cabinets and storage areas with wooden shelves are used for the home. It adapts a modern design in clean lines and sleek style. 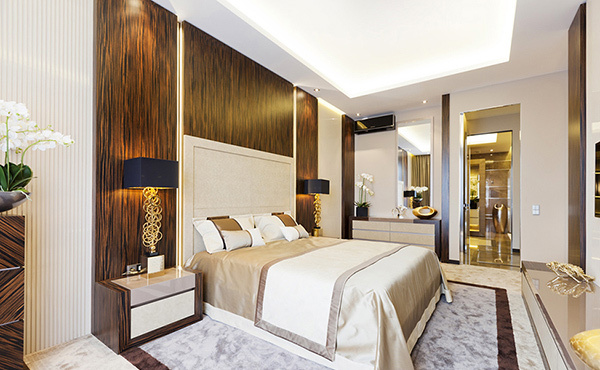 The texture of wood gave this bedroom an exotic touch of beauty. The lamps on the side tables are Art Deco elements that did not fail to illuminate the space with magnificence. 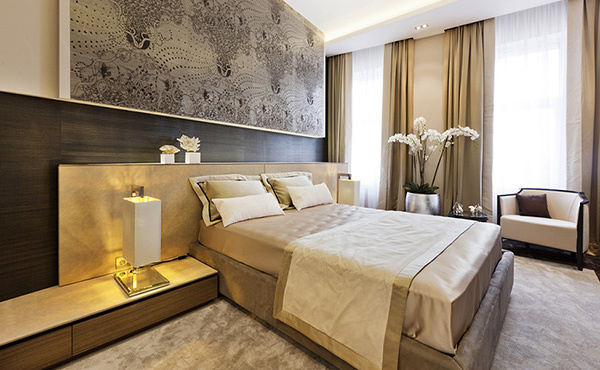 Another bedroom with a similar motif as the one above but this used an oversized wall art above the headboard. 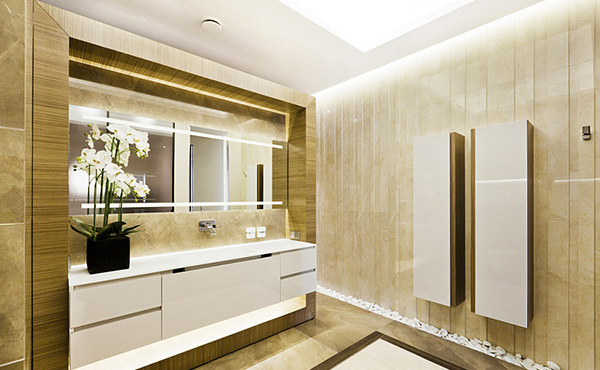 Even the bathroom has a luxurious design but it is pacified by the flower added to the vanity. 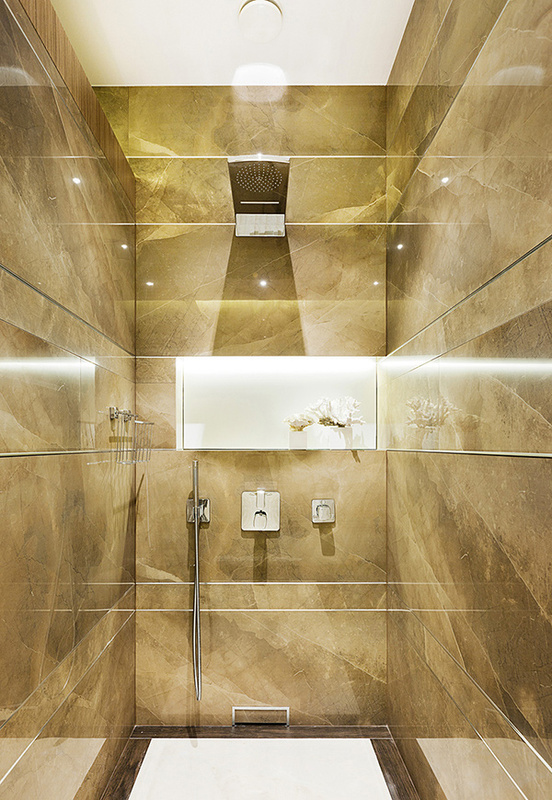 Who would not love to shower in a shower area like this? The terrace is a thing of beauty with nicely done patterns on the furniture. Now you perfectly understood what we mean by extravagance, luxury and grandeur as used to define the interior of this apartment. 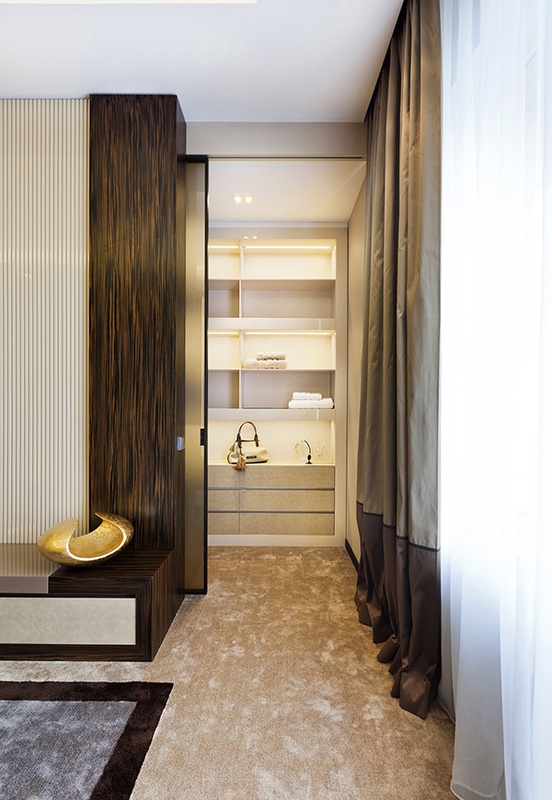 The designers from NG-studio Sanremo achieved to create a premium class interior soaking the entire home with splendor. Don’t you just love this home? It gives you the feeling of royalty but still offering the coziness of a home. It would definitely be lovely to get to stay in a home like this! Mind you, this apartment is merely for the owner’s temporary stay. Imagine how their permanent home would look like! what superb designs, color schemes, undoubtfully marvelous.